1922 Robert Flaherty's Nanook of the North, a record of Inuit Eskimo life, was the first feature film documentary or non-fictional narrative feature film. 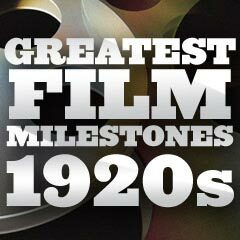 [The word "documentary" was reportedly first used in February, 1926, by John Grierson in his review of Flaherty's Moana (1926) for the New York Sun. The term may also have been used 12 years earlier by famed photographer Edward Curtis in a prospectus for his Seattle-based Continental Film Company, referring to his film In the Land of the Headhunters (1914).] Flaherty's film helped to usher in the documentary film movement, although it raised some controversy because it 're-created' or staged some of its hunting scenes, rather than being truly non-fictional. 1922 Russian filmmaker Lev Kuleshov continued his experiments with montage, a new editing technique pioneered by Russian filmmakers. 1922 During the filming of Merry-Go-Round (1923), director Erich von Stroheim was fired by Universal Pictures' 22 year-old Head of Production Irving Thalberg, for "insubordination...extravagant ideas...repeated and unnecessary delays" and for von Stroheim's alleged unwillingness and stubborn attitude by ignoring directives from the employing studio. It created a new power structure precedent, that the director was no longer all-powerful within the studio system who could do whatever he pleased. Now, the studio executive (or producer) was the true creator and power behind film-making. 1922 Nervous Hollywood (composed of major US film studios) censored itself by creating the Motion Picture Producers and Distributors of America (MPPDA) - later renamed as the Motion Picture Association of America (MPAA) in 1945, to be headed by former US Postmaster General Will H. Hays. The Hays Office (as it would be called), a film review board (censorship division) and its restrictive "Hays Code" (The Motion Picture Production Code) by 1930, was created to serve as Hollywood's public relations organization, and to clean up the motion picture industry. 1922 A New York York State Court ruled that actors cannot prevent the re-editing or re-release of a film in which they appeared. 1922 The Toll of the Sea (1922) debuted as the first general release (widely-distributed or commercial) Hollywood full-length feature film (five-reels, approx. 54 minutes) to use the improved two-tone Technicolor process. It also starred Anna May Wong (as Lotus Flower), the first prominent Asian-American leading lady. 1922 The Power of Love (1922) - now a lost film - was the first 3-D feature film shown to a paying film audience, at the Ambassador Hotel's 'theater' in Los Angeles in September, 1922. The stereoscopic film was projected 'dual-strip' in the red/green anaglyph format, making it both the earliest known film that utilized dual strip projection and the earliest known film in which anaglyph glasses were used. The film utilized and may have been the only commercial film produced in the dual-camera, dual-projector system developed by Harry K. Fairhall and Robert F. Elder. Another 3-D stereoscopic film screening to a paying audience was in December, 1922. It was a stereoscopic print of the 14 minute documentary film Movies of the Future (1922), shown at the Rivoli Theatre in New York City. It was mostly a travelogue of NYC. 1922 German director F. W. Murnau's influential, expressionistic vampire film Nosferatu, a Symphony of Horror - or Terror (aka Nosferatu eine Symphonie des Grauens, Germ.) (1922) initiated a trend for Gothic tales of horror. It was considered the first genuine vampire picture. It starred Max Schreck as Count Orlok - a rat-faced vampire. Without authorized rights to the Bram Stoker 1897 novel, Murnau had to rename his vampire Nosferatu, while vampirish Count Dracula was named Count Orlock, and the action was changed from Transylvania to Bremen. 1922 49 year-old film director William Desmond Taylor was found murdered in his Los Angeles apartment with a bullet in his back in February. There were over a dozen potential suspects in the mysterious scandal, including: (1) Keystone Kops heroine and popular actress Mabel Normand (Taylor's lover who had spent the early evening with him), (2) 19 year-old blonde starlet Mary Miles Minter who starred in Anne of Green Gables, (3) Minter's protective and angry "stage mother" Charlotte Shelby, and (4) African-American houseman Henry Peavey. The murder was never solved, and the situation was further complicated by rumors that Taylor was homosexual or bisexual. Eventually, nobody was ever arrested or tried for this sensationalistic and fascinating crime, although combined with the Fatty Arbuckle case in 1921-1922 and Wallace Reid's drug-related death in early 1923, a new age of censorship would soon be dawning for Hollywood. 1922 Roscoe Fatty Arbuckle (1887-1933) became the first film star to be banned or "blacklisted" from the film industry - he also received public ostracism. The announcement was made by Will H. Hays of the newly-formed Motion Pictures Producers and Distributors of America (MPPDA) on April 18, 1922, six days after Arbuckle had been acquitted in a third trial of the manslaughter of good time girl Virginia Rappe. As a result, all showings and bookings of Arbuckle films were canceled, and the film star's career basically came to an abrupt end. 1922 German Shepherd Rin Tin Tin became cinema's first canine star - and helped save its studio (Warner Bros.) from bankruptcy during the silent era. Rin Tin Tin made almost 30 films for the studio, beginning with The Man From Hell's River. 1922 The first Walt Disney cartoon was Little Red Riding Hood (1922), one of his Laugh O Grams studio productions that he made at his own animation studio in Kansas City before relocating to Los Angeles shortly thereafter. 1922 Impresario Sid Grauman opened the Egyptian Theatre in Hollywood -- the first 'movie palace' outside of downtown Los Angeles. It had Hollywood's first film premiere on October 18, 1922 - showing UA's silent swashbuckler Robin Hood (1922), starring Douglas Fairbanks. 1922 Producer Hal Roach's two-reel short silent film One Terrible Day (1922), the first "Our Gang" (or Little Rascals) comedy, was released by Pathe. Although it was the fourth "Our Gang" episode to be produced, it was the first to be shown. The most popular of the comedy's original characters included: freckle-faced, red-haired and gap-toothed Mickey (Mickey Daniels), scruffy and wild-haired Jackie (Jackie Condon), black "Sunshine Sammy" (Ernie Morrison), and Peggy (Peggy Cartwright). The Our Gang shorts ran in theaters from 1922-1944, although the casting went through many changes during those years, and included 41 child actors-performers. During the early silents period, there were six Our Gang films released in 1922, 14 in 1923, 13 in 1924, 12 in 1925, and 10 in 1926. 1922 The 14-minute, black and white documentary short Movies of the Future (1922), directed by William Van Doren Kelley, was the first (or earliest) attempt at projecting a stereoscopic (3-D) print to a paying audience, at the Rivoli Theater in NYC. The short was composed of two separate films shown together: Plasticons (1922) and New York City (1922).